It’s 11:55pm on September 1, 2014, and in 5 minutes, it will be a new day…and specifically for our family, the start of another year. Trey went to be with Jesus at 12:00pm on September 1, 2013. I remember driving home from the hospital in Dallas that day with all of our family in the car, except Trey. His spot in the car was empty, and the spot he left in our hearts made us feel even emptier! Our family was in shock. We had come home from Dallas so many times, but this time was so incredibly different. Trey and I had made countless trips to Dallas together over the years, and now he was gone…just like that…gone. There are so many days I still just can’t believe he is not here. It’s the strangest feeling to have and so very difficult to live with the emptiness his absence leaves in our hearts. The last year for us has been filled with many ups and downs…blessings and challenges. We have had to keep going…one step and one breath at a time. This is a place our family has never been in before, so we are all learning how to “re-live.” This is not how Emily and I saw our lives going…we did not ask for this…our kids did not ask for this…but it is here, it is reality, and it is sink or swim. So…we’ve been swimming this year so to speak, even though at times we have all felt like we were drowning. But, by the sheer grace and mercy of God, we have and continue to persevere. We have also had so many people come along and encourage us, support us, pray for us, love on us, and minIster to us! We could never say thank you enough to all the wonderful people who have and continue to help us in our journey. We love you all so much! 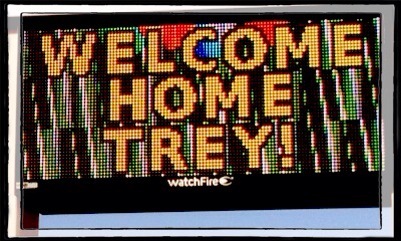 The most rewarding part of this year has been seeing the far reaching impact of Trey’s life and testimony. This is no exaggeration, but thousands of people have come to know Christ because of God’s redeeming work in Trey. 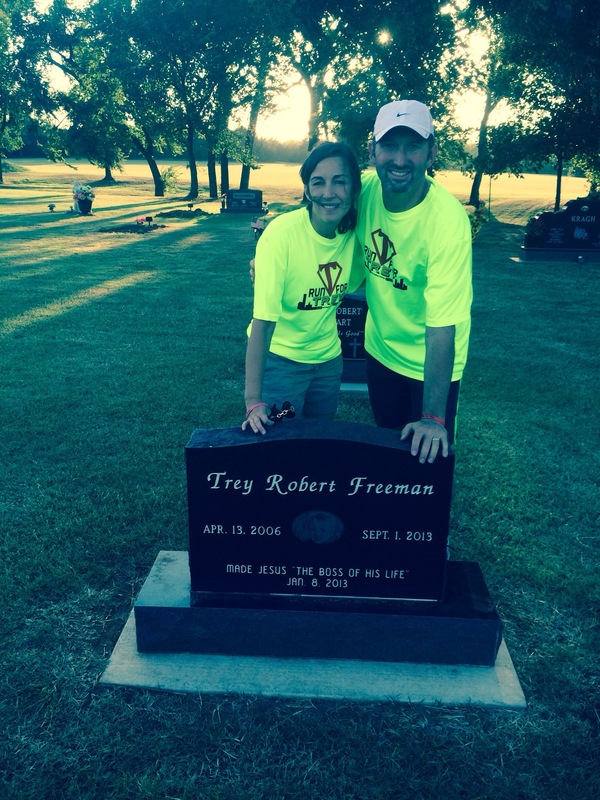 So many people have made Jesus the “Boss” of their life, just like Trey did on January 8, 2013. His story has been shared in numerous cities, states, and countries…and people’s lives continued to be impacted by a simple 7 year old boy. Every time we hear that someone was saved, or encouraged, or changed because of Trey, it brings tremendous joy to our hearts. We have all simply been reminded of the importance of living with an eternal perspective, and we are so grateful that eternity continues to be impacted because of Trey’s relationship with his Savior, Jesus Christ. God was very good to our family today. In fact, I woke up after having a very nice dream about Trey. In the past year, I have only had a couple of dreams about Trey, so it was extremely nice to dream about him. In my dream, I was watching him swim and as he jumped into the pool, I swam over to him to make sure he was okay. When he came up out of the water, he initially pushed me away, but once he realized it was me, he smiled, hugged me, and held on to me. I woke up with tears in my eyes and a smile on my face. As Trey would say, they were “happy tears.” I long to hold him and hug him again. He was always my best snuggler and I simply can’t wait to wrap my arms around his neck again in the New Heaven and New Earth! did some swimming (something he loved to do), went to the graveside, and ate at one of Trey’s favorite places tonight. It was a hard, but good day. I was grateful today was a holiday and that the whole family got to be together. There were many other blessings throughout this day as well, and we were thankful for each one. 2. While you are on this earth, live for eternal things! My life verse is 2 Corinthians 4:18 which says, “So we fix our eyes, not on what we can see, but what we cannot see, for what is seen is temporary and want is unseen is eternal.” May we all keep living for the unseen things…the eternal things. Thanks for taking the time to read this. We love each of you and we so appreciate your prayers. I will keep writing the things God puts on my heart and sharing Trey’s story until Jesus comes back or takes me home! We love you Trey! You are forever our hero and remain in the deepest part of our hearts. Thank you for bringing such joy to our lives. You were an incredible son and your daddy loves you so much. I thank God every day for the 7 years I had with you. I didn’t deserve you, but I am so glad God gave you to me. I am a better person because of you. Thank you for impacting my life. I WILL SEE YOU SOON BUDDY! It was at this time, on this day, last year when Trey closed his earthly eyes for the last time, but opened his eternal eyes for the first time in the presence of Christ! 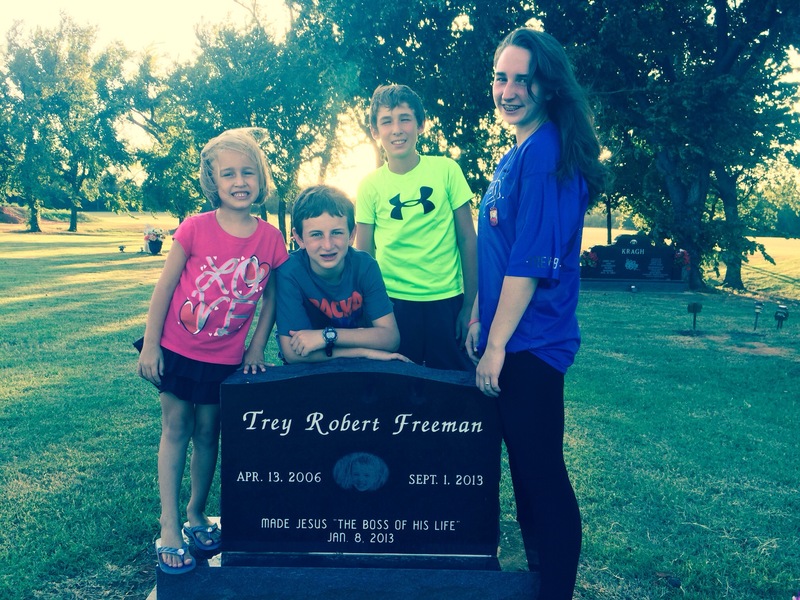 Trey only had one question every day when the doctors made their rounds, and the question was, “Can I go home?” As you know, on September 1, 2013, Trey finally went home! I plan to write a deeper reflection a little later today. We love you Trey and miss you forever.